22 August 2016, at 6:00a.m. US - Unfortunately, we lost $10- $12 in the futures market in just 6 weeks. Using the latest hogs and pigs report numbers we are probably going to set new weekly slaughter records this fall. With that said, I do not see the need for packers to chase cash hogs for a while, writes Allan Bentley, US Sales. I do not study technical charts that much, but any kind of retracement for winter futures months need to be sold. Getting through that time with limited red ink on the books seems to be the best option. The good news according to the latest yield estimates, corn will be abundant. With the corn crop getting close to the finish line, and a national yield of 175, I do not see corn heading higher at least until next spring and summer. If there is some sort of weather rally at that time it is going to be limited by the fact that we have plenty of carry over. The part of the crop report that I question is the 800 million bushel of new corn usage. I would think to get that much more business the corn price will have to be at lower levels than this and for an extended period. We will see, but I would not bet on that much new corn usage unless corn price drops another leg lower. 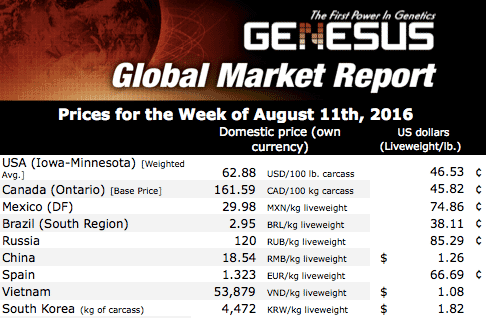 Another bright side of these markets right now seem to be cull sow prices. They have gained substantially in the last 6 weeks. With cull sows higher than butcher price it gives producers an opportunity to roll new gilts into a herd and not spend any money doing it.